The President retracted the ban of asbestos in the face of Russian pressures. The glyphosate ban is now under review in the face Japanese concerns regarding the alternative chemicals used in tea plantations. Now it is time to talk about the polythene ban, the third in the unholy trio of bans imposed by the President. As somebody wisely advised, if you can’t turn your bullet points into a narrative, you have a problem. In the same vein, a judge would say that a “judgment won’t write,” if the judge finds it difficult spell out his/her opinion supported by evidence and the law. In Government, in contrast, expert committees appointed for various purposes have no problem producing lists of unsubstantiated opinions as recommendations. Typically, a committee meets a few times, with an unenthusiastic bureaucrat in charge. The few invited subject experts or stakeholders are vastly outnumbered by bureaucrats representing various departments. More often than not these few stakeholders don’t have enough time or the enthusiasm to make a contribution, except for those with axes to grind. Why analyse when it is easier to opine? In the parliamentary tradition, a white paper is an authoritative report or guide that is presented by policymakers prior to presenting a cabinet paper on an important topic. The objective is to inform and receive feedback from all stakeholders. With the Sri Lankan polity ready to pounce upon anything that looks like a policy, white papers have disappeared from the policy arena in Sri Lanka. The present PM knows this only too well. The education white paper presented by him in 1981 was unduly criticised and had to be shelved. The ‘Regaining Sri Lanka’ document was one the best analytical policy documents ever presented in my opinion, but it was vilified by the Opposition. Since then what we have are hastily put together Cabinet papers which try not to ruffle the feathers of the more vociferous stakeholders. There aren’t many politicians who would insist on the evidence, make the hard decisions based on the evidence, and take ownership for carrying the legislation through. More often than not the easy-lazy path is taken. The committee at its first meeting consisted of 19 members of whom 14 represented various related Government agencies. The five outsiders included Professor Jagath Premachandra of University of Moratuwa, Hemantha Withanage of Centre for Environmental Justice, K.A. Jayarathna of Sevanatha, Vidyananda Sellahewa of P&S Polycom and Priyantha Wijeratne of BASF. Although the Committee’s mandate concerned managing of polythene use to minimise environment problems, there is no indication that the committee heard from supermarkets, small business associations or waste managers who are the people knowledgeable about use of polythene. BASF is subsidiary of a large multinational corporation providing chemicals and chemical products. P and S Polycom is presumably a manufacturer of polythene products. Add more bullets, why not? At the first meeting itself the committee had accepted the recommendation with some editing and tightening, and had tagged on four other recommendations to ban. It is not clear whether there was discussion on the marginal cost and benefit of increasing the thickness from 20 to 40 microns. Further there is no indication of a discussion on charging for use of shopping bags, which is successfully used in many countries including the UK. 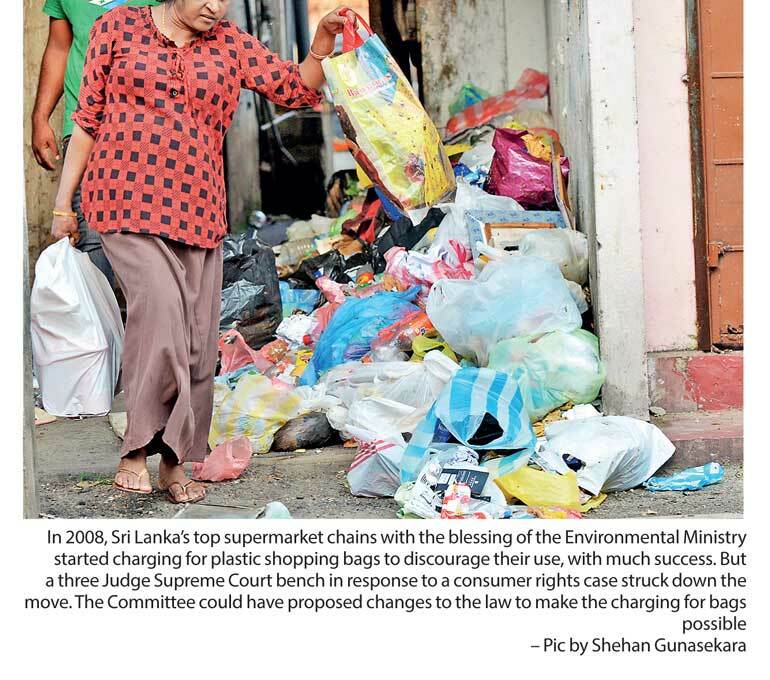 In 2008, Sri Lanka’s top supermarket chains with the blessing of the Environmental Ministry started charging for plastic shopping bags to discourage their use, with much success. But a three Judge Supreme Court bench in response to a consumer rights case struck down the move. The Committee could have proposed changes to the law to make the charging for bags possible. PET or polyethylene terephthalate based bottles are popular with recyclers for their ease of collection and recycling. Again there is no rationale for the banning. If the issue is leachate into the liquids contained, arguments should have presented. If the issue is littering, strict fines for littering could be imposed and problems faced by recyclers in collecting and recycling PET bottles should been considered and addressed. Instead the committee takes the easy way out and recommends banning. Actually, the committee’s report includes two sets of evaluations on the impact of biodegradable plastics – One is by a research scientist at the Industrial Technology Institute and the other by an unnamed source. Both advise against the adoption of bio-degradable plastics. In addition to local expertise, the experience of other countries in using biodegradable plastics should have been considered. A certain vendor of biodegradable plastics from Indonesia, who apparently had made a presentation to CEA, has claimed that their products have been successfully used in Indonesia. The committee does not seem to have considered the arguments against biodegradable plastics or taken the effort to learn from good international practices. The committee met further on 2016/12/30 and 2017/01/17, respectively, to review an action plan and to finalise the set recommendations, respectively. The end product is essentially an expanded version of the list of products to be banned that were presented to the committee on its first sitting. (2) To prohibit the manufacture of food wrappers (lunch sheet), etc. (6) To prohibit the manufacture of food containers, plates, cups, spoons from expanded polystyrene. Biodegradability of plastic products is a highly-contested issue. The CEA should do a thorough evaluation of the so-called biodegradable polythene in the market and lifecycle of those used. If this ban has not impacted the littering of polythene in the environment, polluting the waterways and the ocean and polythene sent to waste dumps, CEA has some serious revisiting to do. Sri Lankans are innovative when it comes skirting the law. Apparently, calcium carbonate and benzene or derivative additives used with polyethylene gives a product that can pass off as biodegradable polythene made of cellulose. These claims need to be checked out. Businesses are most likely to pass on the burden of regulation to the consumers and to the environment. In response to the ban, supermarkets now use 20-micron gauge low density polyethylene (LDPE) bags. These bags tear easily and double-bagging or triple bagging is very common. With no possibility of reuse of recycle these end up as garbage. In the case of asbestos and glyphosate bans, pleas by local stakeholders went unheard at first. Scientific evidence combined with economic prudence was against a ban but pipedreams of a zero-chemical environment were hard to counter. It is only when Russia and Japan reacted that local stakeholders got a reprieve. At the end of the day, our environment is the silent victim of this kind of ‘lazy’ policymaking by authorities. Who will stand up for waterways that continue to be blocked with LDPE polythene or communities affected by waste dumps that grow higher as so-called biodegradable polythene lie unchanged in environments unsuitable for degradation?